Divination by means of a mirror or mirrors. Who's the most gullible of the them all? Mirrors are a bit creepy. Who hasn't hesitated to glance in a mirror at night for fear that something different might be looking back, or even that you're not in the reflection at all? 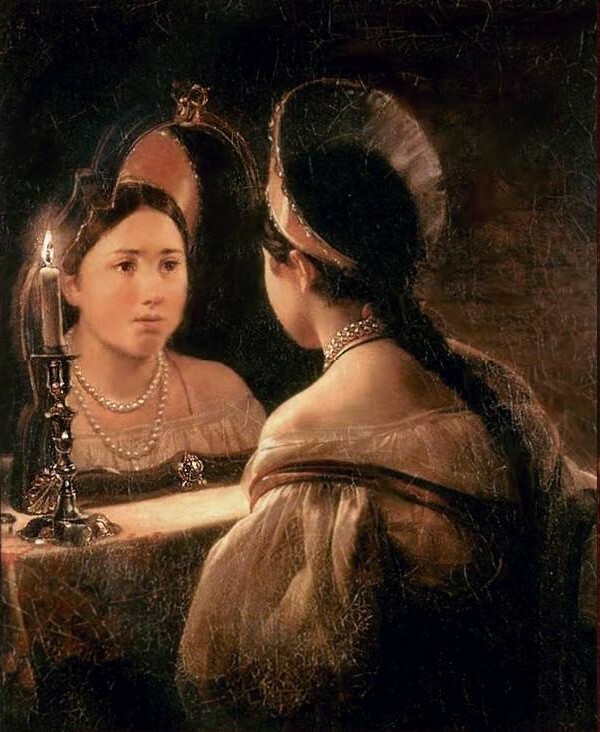 Perhaps it's due to their inherent creepiness that mirrors have become so associated with the occult and superstition - breaking a mirror, of course, is said to bring seven years' bad luck, and mirrors are often covered with a black cloth at wakes for fear that the soul of the departed will become trapped. Oh, and don't let a child younger than a year look into a mirror because he'll develop a stutter (obviously). And there's also catoptromancy - the use of mirrors for divination. I'm lead to believe that, of all the divinatory arts, catoptromancy is one of the hardest to master. All I can say is, if you really are so easily lead (that's a good pun so I used it twice) that you believe in catoptromancy, there's no two-ways about it - it really is a sad reflection on you and your gullibility. If you're a catoptromancer, how do you look at yourself in the you-know-what? Do please take a moment for self-reflection and leave a comment in the box below. Oh, it's true, it's true. Sometimes I glance in the mirror and see a much older person than I really am. If that's not seeing the future, what is? Oh my, Sally ... you're right! When I look in the mirror, I see the man that I will become if I eat too much and don't get enough exercise. How foolish I was to be so dismissive of the mirror's insights! I always ask my mirror for advice on big decisions, which is a bit daft on reflection. Transparently daft ... which ... is a pun that doesn't really work. The rear-view mirror in our car was freaking us out so we removed it and I can honestly say we haven't looked back since. That's funny, because our left wing-mirror was upsetting us, even though the other one looked alr ... no that's rubbish! Well done, C - best mirror pun of the day. When I look on the mirror I don’t see myself – but someone slimmer, prettier - such a different version of myself. But the same happens when I see pictures from the past. I really don’t have an idea of how I really look like (I’ not joking!). But I look good in the mirror. Except those at the fairs – enlarging, distorting and whatnots ;) – but who would?! Please tell me you don’t either and I’m not really like THAT ;). So if I am a catoptromancer besides not being able to spell and brag about it I really can't tell... what I could tell you are the ways (sure proof, tested through centuries ;)) to overcome all you mention when you mess with you-know-what but it’s too long for a comment XD. Follow the first link in the post, Teresa, and you'll read about a bizarre psychological condition in which one can't see their own own reflection. As strange as it is that we all seem to be seeing different versions of ourselves, not seeing anything is where it gets really weird! Beware: this picture is not eye-candy!